It took Sirius 17 drill holes to hit a width of nickel in the Fraser Range. On hole 24 they hit the mother lode and discovered the Nova nickel deposit. RTR have intersected copper sulphides of considerable widths within the right kind of rock units – the Fraser Range mafic gabbro units. This is the same type of rock unit which hosts magmatic nickel-copper sulphide deposits. Hitting gabbro with sulphides is a significant result. The results indicate that the EM conductor is within a mineralised zone. The conductive zone is not graphite, and it’s not an iron sulphide system – it has some of the good stuff – copper. This is an impressive conclusion after drilling just three holes (2 inches wide) across a 2km wide conductor. More drilling is needed to understand this large mineralized system. It is common to find disseminated sulphides including copper around world class nickel ore bodies. RTR haven’t found one yet, but are certainly a few steps closer. RTR are still in the early stages of exploration, but the result signifies that they are on the right track at Big Red. RTR has proven the concept that the eastern side of the Fraser Range is prospective for magmatic nickel-copper sulphide ore bodies. Both RTR and global mining major Vale are the biggest landholders across the eastern side of the Fraser Range. The next step for RTR is to release the results of the downhole electromagnetic (EM) survey. The down hole EM survey will allow much greater accuracy than a ground EM survey – and permit RTR to survey 700m of strike below ground. The drill cores should be assayed shortly to provide important geochemistry to add to the downhole EM data. These results are due in the coming weeks, so there is still plenty more to learn about RTR’s Big Red Project. 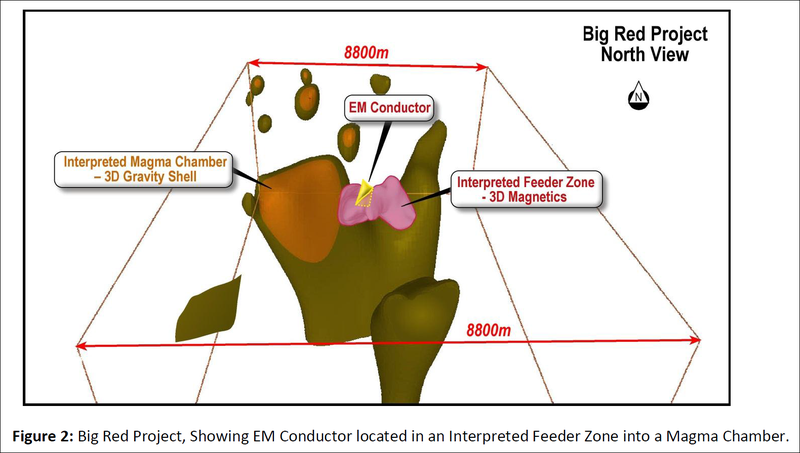 RTR found a 2km long EM conductor at Big Red earlier this year, along with a number of similarities to the 13.1Mt @ 2.1% nickel Nova-Bollinger discovery that propelled Sirius and opened the Fraser Range nickel rush. 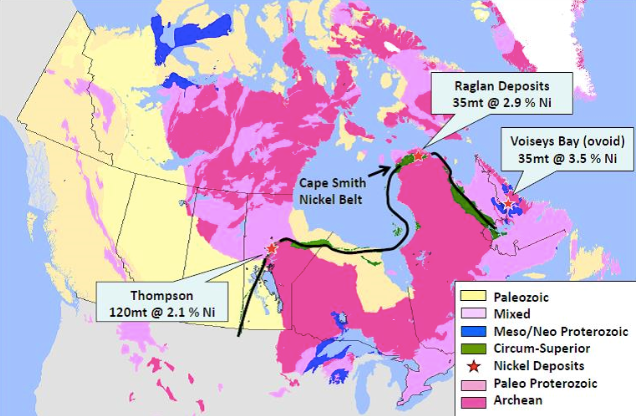 The rocks are similar, the signals are similar – and there are even similarities at Big Red to the 35Mt @ 3.5% nickel Voiseys Bay deposit up in Canada. 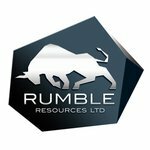 RTR is now fast tracking that downhole EM survey and assaying the drill cores – this should significantly widen the underground picture it has at Big Red. Hopefully this will further confirm what the drilling has found and generate more targets of interest. The Nova-Bollinger discovery by Sirius may be the first of many that could make the Fraser Range into a world-class nickel province. There is the opportunity to define a nickel belt, possibly on par with the Thompsons Bay nickel belt in Canada. With RTR’s first drill holes in the Fraser Range adding to their grounds prospectivity, and downhole EM results out shortly, we should soon gain a much better understanding of the potential of RTR’s Big Red Project. RTR first appeared in our investment portfolio back in September when we published the article So You Think Sirius Is Big? $5M ASX Explorer Drilling in Weeks . 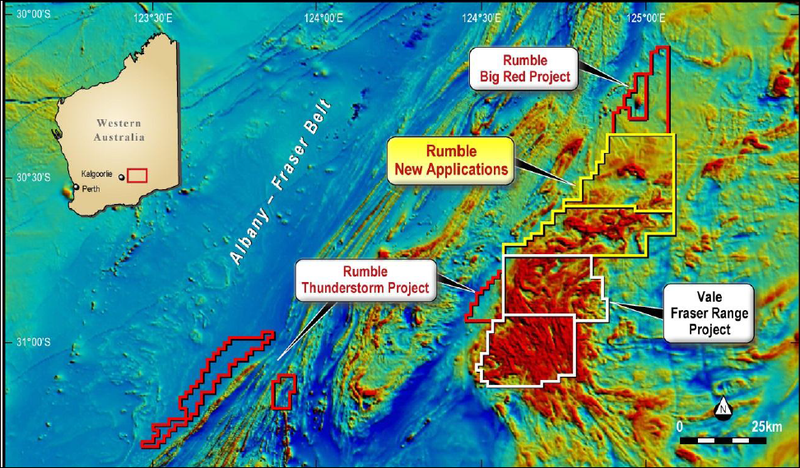 Big Red – This project covers 1,491km2 and is home to a 2km wide EM conductor, RTR’s primary exploration focus. RTR has just drilled three holes to target depth into the conductor and intersected multiple sulphide zones. Zanthus – Located just 18km from Nova-Bollinger, Zanthus covers 1,363km2 of highly prospective land. So far, RTR has worked up five bedrock conductors over a large eye; and a drilling campaign is being planned right now to test the targets. Thunderstorm – This is 406km2 of land over four 100% owned tenements. RTR is planning a wider exploration programme for this largely untouched land holding right in the middle of the highly prospective Fraser Range. All of RTR’s activity right now is centered on Big Red – and in October as RTR charged ahead, we published RTR Days Away From Fraser Range Diamond Drilling . This could be evidence of a large mineralised system – the very thing that points to a nickel resource. A downhole EM survey is now underway to further test this theory. The Big Red drilling is our focus in this article, and we’re going to run you through all of the particulars and cast our eyes to the horizon for RTR’s next moves. This world class nickel belt wasn’t discovered overnight. It was the result of lots of hard work over many years, with multiple discoveries adding up to make this nickel belt what it is today. The 13.1Mt Nova-Bollinger resource that’s fuelling Sirius’ success story shows very similar mineralization to the Voiseys Bay resource up in Canada – something never seen in Australia before. The reason why we have invested in RTR and other Fraser Range companies is that Nova-Bollinger may be just the first discovery of many more in the Fraser Range, in the same way multiple nickel discoveries were made at Thompson Bay. 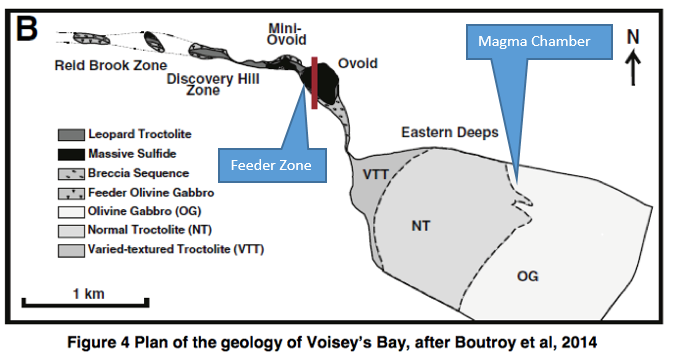 The Voisey’s Bay style feeder system at Big Red is the main target of RTR’s exploration efforts right now – and could prove to be the key that unlocks RTR’s potential in the Fraser Range – and potentially make Nova-Bollinger’s nickel tonnage look like peanuts. RTR’s exploration strategy is to work up its targets and drill them as quickly as possible. Its three projects in the Fraser Range all have exploration plans that can be tackled one after the other or simultaneously. RTR’s maiden drilling programme in the Fraser Range at Big Red kicked off on November 7 th and was completed very quickly. 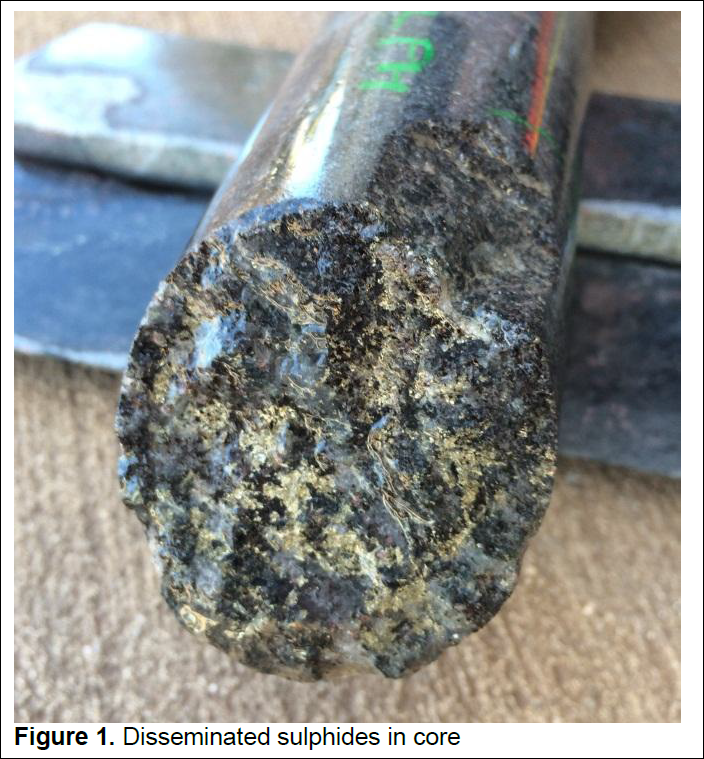 That’s a drill core from RTR’s exploration programme at Big Red and as you can see it’s full of disseminated sulphides – is this a hint of a nickel deposit? The first drill core that was sunk into the EM plate was abandoned due to difficult drilling conditions at 240m. 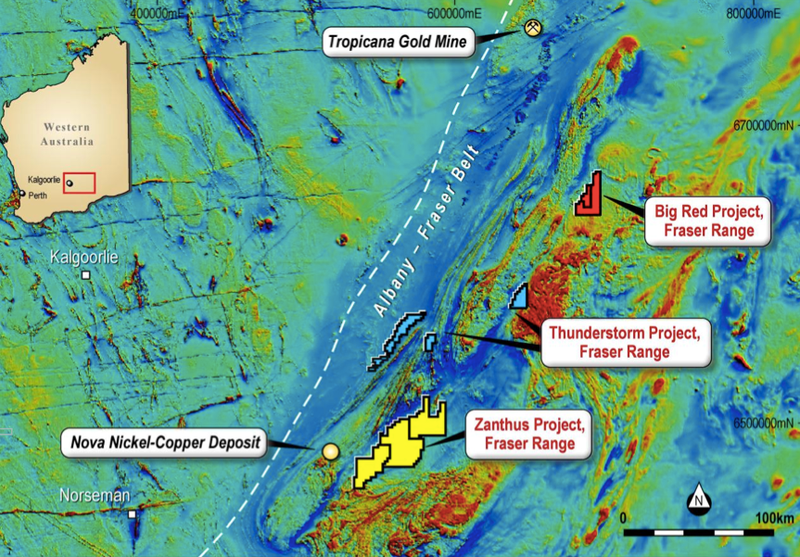 The next three drill holes intersected sulphide zones within the gabbro rocks of the Fraser Range complex. Gabbro rocks can host magmatic Ni-Cu nickel sulphide deposits and are the host rocks for Sirius’ 13.1Mt Nova-Bollinger resource – and their presence at Big Red, combined with the 2km wide EM conductor, means that RTR may be onto something. 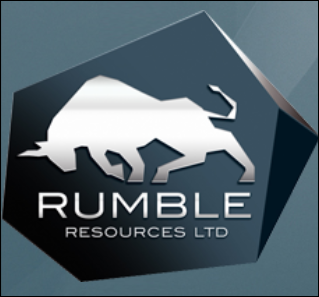 And now that it has intersected disseminated sulphides in three drill holes over the EM plate, RTR says the conductor could be a large mineralised system – a nickel deposit in layman’s terms. But the test area was tiny – remember, the EM conductor is 2km long – so to get an even bigger picture, RTR is doing more exploration right now. 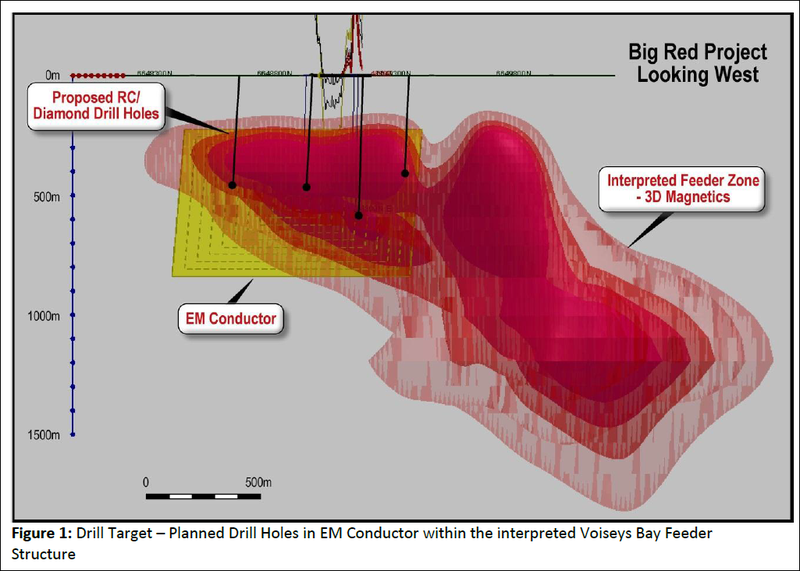 The thee drill holes that RTR just sank into the 2km long EM conductor at Big Red covered a total strike length of just 500m – a very small area. 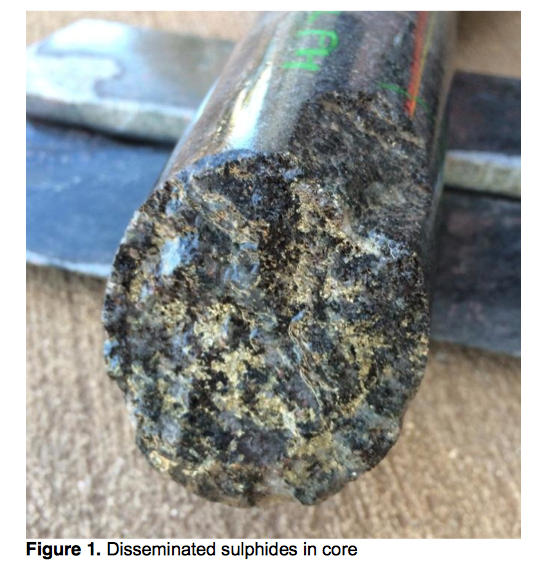 Yet the results they brought to the surface are compelling – intersects of disseminated sulphides that could point the way for a mineralised system. So to widen its scope, RTR is fast tracking a downhole EM survey, where a magnetic probe is inserted into each drill hole so a subsurface electro magnetic reading can be taken. The drilling operator at Big Red, DDH1 , is now demobilising its rigs and will begin the downhole EM work imminently. The downhole EM survey can look 100m in all directions – and seeing as the three drill holes at Big Red are over 200m apart, the survey should be able to cover at least 700m in the target area. We are looking forward to what RTR finds with this fast tracked downhole EM survey – will it be more evidence of a mineralised system at Big Red? More targets to drill? We could see results in weeks, even days. In less than a year, RTR has swooped into the Fraser Range, snapping up three highly prospective tenements and kicked off its maiden diamond drilling programme. At The Next Small Cap , we laid our money down on RTR because it promised to conduct a fast, aggressive exploration programme in the Fraser Range with lots of catalysts on the boil at all times – just the things we like. And RTR has more than kept its promise – it’s now starting to deliver some tangible results. The intersects of sulphide mineralisation at Big Red are very encouraging and the fast tracked downhole EM survey could bring us closer to the big goal – confirming the existence of a nickel deposit at Big Red. We’ll be looking out for news of the downhole EM results at Big Red soon. But remember, Big Red is just one of three projects RTR has in the Fraser Range. Casting ahead to 2015, we expect to see plans posted soon for exploration at Zanthus where bedrocks conductors in a structural corridor are waiting to be ploughed into with a drill bit. And at Thunderstorm, its mostly virgin land ripe for exploration – and RTR is steadily drawing up is plans to find what’s under the ground there. RTR is charging ahead and we can’t wait to see what it turns up at Big Red and the rest of its Fraser Range projects.